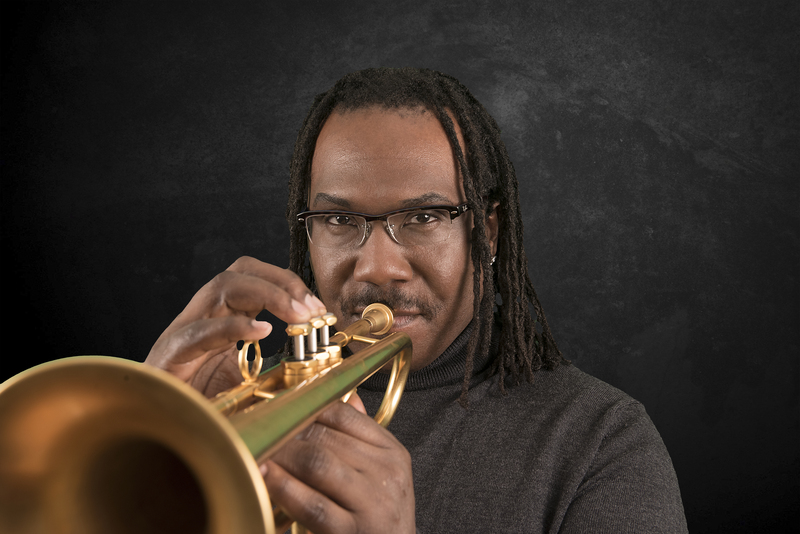 Critically-acclaimed Master Trumpeter, Bandleader, Educator and Recording Artist Darren Barrett is an American jazz trumpeter from Toronto, Canada, the youngest of five children. A student of his craft, this trumpeter (by way of Jamaican parents) continues to awe and energize audiences with his authoritative execution, infectious music compositions, and unpredictable band formations. In 1986, Darren attended Berklee College of Music on a full musical scholarship, which helped him to receive a BA in Professional Music in 1990. After Berklee, he went on to receive his MA in Jazz Performance in 1993, and his MS in Music Education from Queens College in 1995. While a student at Queens College, Barrett met legendary trumpet player Donald Byrd, who became Barrett’s musical mentor, which helped him to fine-tune and cultivate his playing style. Barrett’s desire for musical growth and education had him moving in the direction of attaining his Doctorate degree in music. However, because of his remarkable musical talent and growing popularity across the country for playing fiery tunes with his trumpet, Barrett was sought out to attend the inaugural class of the Thelonious Monk Institute. In 1997, Darren entered and won 1st place in the Thelonious Monk International Jazz Competition, the biggest and most prestigious jazz competition in the world. Darren Barrett has headlined on international stages and has appeared or recorded with some of the most revered names of the idiom, including: Elvin Jones, Jackie McLean, Herbie Hancock, Antonio Hart, Wayne Shorter, Roy Hargrove, and Esperanza Spalding. He has also played with pop icons such as will. i. am, Common, Talib Kweli and D’Angelo. Considered by many to be in a class amongst the most elite of jazz players, Barrett proudly acknowledges his legendary musical influences: Clifford Brown, Mile Davis, Freddie Hubbard and Woody Shaw. He also cites a very credible list of teachers and mentors for having laid down a foundation from which he has drawn inspiration: Donald Byrd, Jimmy Heath, and Barry Harris. Barrett, whom the Boston Globe once heralded as “…a force to be reckoned with”, is committed to using his technical prowess and improvisational excellence as a platform to sustain jazz’s rich cultural legacy while instilling a sense of discipline, excellence and purpose into the next generation of young, great musicians. Barrett continues in the teaching tradition of Art Blakey by affording young and talented musicians an opportunity to share the bandstand with him on stages around the world. Barrett is the bandleader of five uniquely distinctive bands, including: the dB Quintet, Darren Barrett-Energy in Motion, dB-ish, dB Trumpet Vibes, and dB Treyo. Barrett states, “I want to continue exploring music by always allowing myself to remain open to all forms of music.” He believes in giving the best show possible and understands that a great musical product and a great live show will always keep audiences asking for more. Darren released his first album as a bandleader in 1999, entitled First One Up. He then released Deelings in 2001, Wrenaissance Volume 1 in 2004, and A Very Barrett Christmas in 2011. In 2012, he was the featured trumpet soloist on Esperanza Spalding’s Grammy Award Winning CD, Radio Music Society, which went on to win two Grammys. In 2014, he released two musically, high-powered CDs: Energy in Motion: The Music of the Bee Gees and Live and Direct 2014, Darren Barrett and the dB Quintet. In 2015 he released Darren Barrett Trumpet Vibes follow by Darren Barrett – Trumpet Vibes – The Music of Amy Winehouse in 2016. Barrett is currently serving as an Associate Professor in the Ensemble Department at his alma mater, Berklee College of Music in Boston, Massachusetts. He is also an ambassador for music education. In past years, Barrett has lent his support to Berklee’s Office of Admissions, traveling the country promoting music education on behalf of the College’s Music Educators Outreach Tour, in partnership with school districts across the country to develop bourgeoning musicians. Music speaks to the entire human global community. Music has the power to heal, bring people together, and gives voice to today’s challenging social issues. Music helps us to educate our children, cope with difficult times, and imparts soul and inspiration into our lives. Music stirs us to re-envision positive change for our communities, nationwide. It also has no boundaries, no color, no corporate ownership; it can be shared and created by all, and has the power to communicate a message that helps all of us to communicate with each other. Barrett believes that music is the true pulse of life.